The Pier Shops was renamed and transformed into The Playground in 2015. 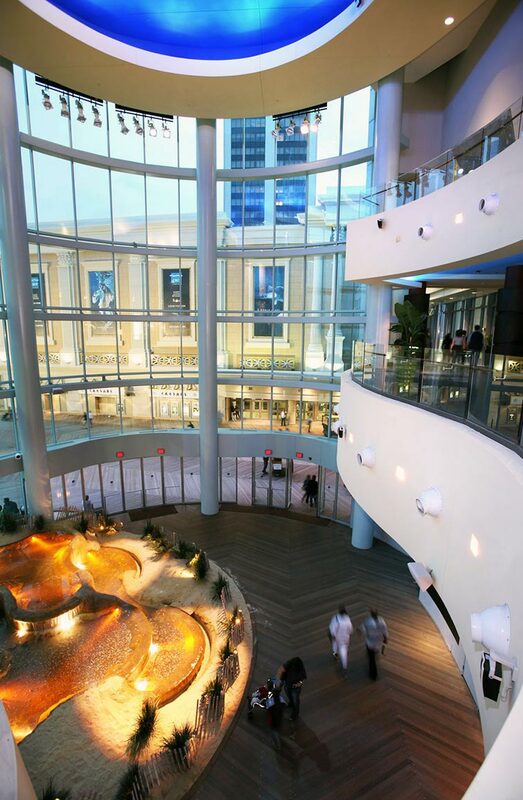 The Pier Shops at Caesars was a breathtaking destination at the edge of the ocean on Atlantic City's famous boardwalk. Visitors could come discover The Pier Shops at Caesars and experience a whole new level of world-class shopping, incredible dining and premiere nightlife. You could explore an amazing collection of shops, offering fine fashions from the world over. Discover Gucci, Louis Vuitton, Burberry, Michael Kors & Tommy Bahama, and other luxury brands. A delicious array of renowned restaurants, including Phillips Seafood, Buddakan, The Continental and Souzai Sushi and Sake awaited shop visitors. Here you could indulge in only the freshest seafood, unique culinary creations, Atlantic City's best sushi and decadent desserts. Find a sumptuous choice to satisfy every craving and enjoy it all along the sparkling Atlantic Ocean. The Water Show or "dancing fountains", an interactive water, light and sound spectacular in the towering atrium at the water's edge was not to be missed, playing every hour, on the hour.